This article was peer reviewed by Fred Heath. Thanks to all of SitePoint’s peer reviewers for making SitePoint content the best it can be! Octopress is an obsessively designed toolkit for writing and deploying Jekyll blogs. Pretty sweet, huh? My joy has known no bounds since I came across Octopress, as creating a blog using it is incredibly easy. Things have gotten even more exciting with the announcement of Octopress 3. Octopress 3 includes features aimed at tackling the drawbacks of the previous versions. The newly-minted Octopress CLI allows you can create a new site, create new pages, add posts, and deploy with ease. In this tutorial, we will create a simple blog, add a post and a page. Along the way, we will also see how to enable sharing to Twitter and deploy everything to Github. And with that, you have Octopress installed! I love Ruby and Rubygems! If you’ve every used Jekyll, it should look pretty similar. By default, the post will be written as a markdown file. Your post content should go below the YAML front matter, which is what the content between the --- is called. Front matter allows page-specific variables to be included at the top of a template using YAML or JSON. Front matter must come at the very top of the template and be separated from the rest of the content by a leading and trailing triple hyphen ---. Between these triple-dashed lines, you can set predefined and custom variables, such as Categories, Tags, and permalink. You can read more about front matter on Jekyll Documentation. That will build a static HTML website that can be found in the _site directory. This is built out of the markdown files for pages, posts, stylesheets, and config. Then, point your browser to the address localhost:4000. Octopress comes with a default About page which is visible from your browser at http://localhost:4000/about/. The page can be found in the home directory of your site. When you generated the site using jekyll build, a folder was created for the about page. Navigate to _site/about directory and you will see the generated page. There is an Octopress CLI command that can be used to create a new page similar to that used in creating a new post. Enter a title for the page, if you like. This will create a new directory called news and an index.md file inside it. When you run jekyll build or jekyll serve, an .html file is created just like you have for the “about” page we talked about. When the site is reloaded, the link for the page automatically shows up in the navigation bar. Google search results) and in your feed.xml site description. From the configuration file, you can add your Twitter and Github usernames. They will show up at the bottom of your page, along with the description. Feel free to edit the settings as desired by adding the necessary information. You will have to restart your server for the configuration changes to show up in your browser. You can stop the server by pressing CTRL+C. Sharing your blog posts to social media like Twitter is important if you want to get a large audience. Fortunately, there is a gem available on Octopress to make that possible. For the purpose of this tutorial, we will focus on Twitter. You can check out the configuration for Facebook and Google Plus here. The other settings can be left as the default. To use the Twitter share buttons, navigate to your site’s default layout and add this tag just below the closing tag. If you want the Twitter sharing button to display on every post, navigate to _layouts/post.html and add this underneath the content tag. Do the same for pages if you want. Reload your browser to see the button. There are other settings available, with you can check out at Octopress Social. We will be hosting our blog on GitHub. Create an account if you do not have one yet. Create a new repository, give it a name in this format; username.github.io, replacing username with your Github username. Mine looks like this kinsomicrote.github.io. Generate the deployment configuration file for our blog using octopress deploy init command. method: git                               # How do you want to deploy? git, rsync or s3. site_dir: _site                           # Location of your static site files. # If using GitHub project pages, set the branch to 'gh-pages'. # For GitHub user/organization pages or Heroku, set the branch to 'master'. With that done, you site should be available! You can check out mine kinsomicrote.github.io (obviously, change the URL to your username). 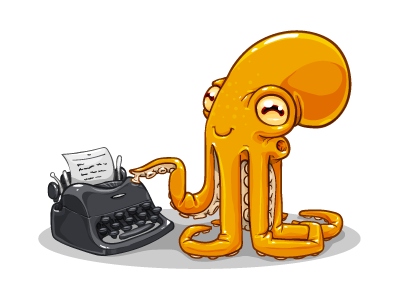 Now you know how to setup a blog using Octopress 3. There are lots of exciting things Octopress 3 brings to the table. I encourage you to delve deeper into Octopress to discover them! Kingsley Silas is a web developer from Nigeria. He has a hunger for acquiring new knowledge in every aspect he finds interesting. The ultimate beginner's guide to Rails! Sinatra is the natural choice for building fast and efficient Ruby applications without the weight of Rails.